My next post was going to focus on my first few weeks of Legion, but some recent events are pushing the WoW Legion Companion phone app front and center in my mind. I was part of a sleep study from Monday through Thursday. It was a bit over 320 miles from my home in Irvine, and it was at approximately 12,500 feet. I was a subject in a study of sleep variations and cognitive abilities at high altitude. My trip isn’t really within the focus of this blog, but I’ll talk about it more on my personal blog in the future. However, it did mean that I was away from my PC for four days right at the same time the Legion phone application was released. While I love WoW and have been enjoying Legion immensely, I wasn’t going to let a game stop me from participating in a fascinating study and fun trip. On the other hand, I was thrilled to find the Legion Companion app released. It meant I could still progress in Legion a bit even while away. Missions don’t require much attention either, so it was really perfect. The app works wonderfully, and if you haven’t tried it, I recommend it. 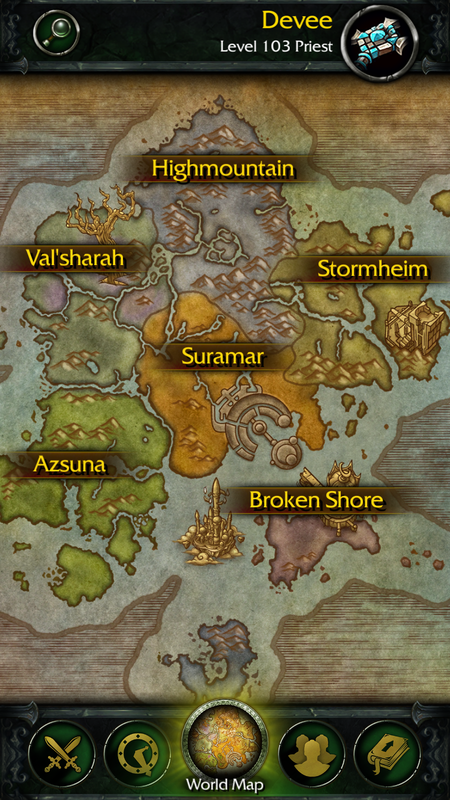 You can see current world quests (which doesn’t matter to me yet because I haven’t hit 110), check your missions, recruit troops, and more. I only have two champions, but I kept them busy. I returned home to find my HDD failing. My computer booted once but took forever and then was terribly slow. I found that no single application was accessing the HDD much, but my primary disk had 100% usage. In my experience, that usually indicates that read/writes are failing. I restarted to scan the disk, but the scans can’t complete. I keep everything backed up, but in the mean time, I can still send my followers on missions for me!